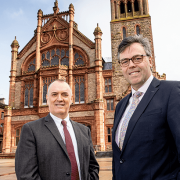 Danske Bank in Derry has launched a second North West Skills Academy, offering 20 local people the chance to gain training and a possible career with the bank as a Customer Protection Analyst. Following on from Danske Bank’s announcement last August of the creation of 67 new jobs in Derry, support from the Department for the Economy will see the company collaborate with North West Regional College to deliver 20 high quality training opportunities. Participants in the Academy who successfully complete the course will have a job interview with Danske. Ann Williamson, Head of Employer Skills at the Department for the Economy, said: “Increasing the skills levels of the workforce in the North West, through Assured Skills Academies helps to meet the needs of growing companies, support economic growth and enhance productivity. “Assured Skills Academies enable employers to work with training providers in the Further and Higher Education sectors to deliver industry-relevant, pre-employment training, helping ensure that expanding businesses can bring on board the people they need to grow and compete.” Niall McGarry, Senior HR Business Partner at Danske Bank, said: “This Assured Skills Academy follows on from the success of the first NW Academy last year and is a signal of our continued commitment to the local area.